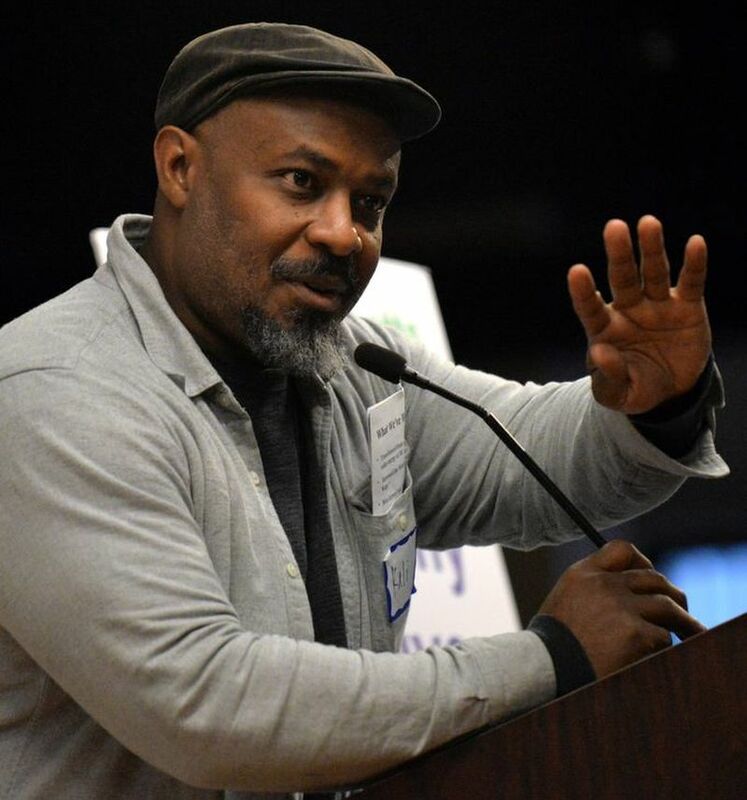 As one of the co-founders and now Executive Director of the non-profit division of Cooperation Jackson, Kali Akuno is working to transform the city into ‘a beacon of radical politics’. For the uninitiated, Jackson is the capital city of Mississippi, with a population of around 200,000 people, its 80% black population making it one of the blackest cities in the US, and with 60% of people living below the poverty line. Cooperation Jackson is working, in a context of colonialism, white supremacy and patriarchy, to upend these dynamics through the building of a solidarity economy, to, as he puts it, “transform the material circumstances of the people living in Jackson”. “I was the principal author of the plan as it came to the public, but it was something that was put together first as a study group within the New Afrikan People’s Organization, and the Malcolm X Grassroots Movement. Really shortly after September 11 was when the study group first started to come together to try to adjust to the new political reality that we saw evolving within the United States. One of our main concerns was that many of the practices and acts that were technically illegal in the 50s, 60s and 70s, under the guise of the counter-intelligence programme, or COINTELPRO being operated by the FBI, the Patriot Act, and things like it, the Executive Orders that George Bush signed in secret in the summer we made public, but they were going to make all of the most egregious acts of spying and espionage, both internationally and domestically, it was going to make them legal, and that came to pass. Kali and colleagues at the World Social Forum in Tunisia. We try to think that since our organisation and other organisations have been targeted by these programmes in the past, we needed to use some foresight and try to do some repositioning of ourselves, to be able to both execute our own vision and notion of social liberation and how to do it under new circumstances. After some trial and experiment, over about a five year period, it was really after Hurricane Katrina, and its overall political and social impact, that the Jackson-Kush Plan came into focus. Recognising where we had our strength and what we needed to build upon we came up with the basis of where our organisation would try to concentrate its energy and concentrate its forces. After about a year of going through our internal analysis, everything just kept looking at Jackson Mississippi. So in 2006 we really started to concentrate on building on the historical legacy – of the the New Afrikan Independence movement, which our organisation came out in its work in Mississippi, in Jackson in particular, the organisational base that existed here that the Malcolm X Grassroots Movement had been diligently working on since the late 1980s – and we thought this represented the best place for us to really try to work on implementing a new vision. One that dealt with trying to deal with the climate crisis in a real way, because that was also a big thing that we took away from Hurricane Katrina, was recognising that climate change was here. Not something that was coming in the future. That it was present and it was going to have an impact, particularly in the deep south, and particularly upon black people who are heavily concentrated in the deep south and that we need to be proactive in trying to take it on. For us that meant both exercising political power to be in a position to shape some of the policies that would curb all the practices of extraction and utilisation of fossil fuels that leads to the climate crisis, but also how do we meet the basic needs of our community to address the inequities that we have long faced. We started thinking, what are the best practices out there? What are the best tools out there from around the globe? And just within the United States that we can draw upon? And find a way to practice and put the utilisation in our local context, that would shift some of those relations and come up with new ways of producing for our community that were as carbon neutral as possible and had the least amount of impact on the environment as possible. These are the things that were kind of the background, if you would, to the public release of that document first in 2008. That became the Jackson-Kush Plan. And then moved into practice on a higher level in 2009 when Chokwe Lumumba was elected first to the city council. There are three basic things that we’re trying to implement within this plan in a co-ordinated way. One is independent electoral politics. The other one is what we call the deepening of democracy by creating dual democratic institutions that run parallel to the state that both keep it in check, hold it accountable, hold our elected officials accountable, but also organise to develop a programme of autonomous development and implementation. Things that we do for ourselves that the government cannot do, does not have the resources to do. That is best expressed through the development of the People’s Assemblies that we’ve been working on building really over the past 20 something years plus. Then there’s building and developing the solidarity economy. That particular piece is the challenge that Cooperation Jackson took and is working on trying to fulfil. Those are the three basic elements of the Jackson-Kush Plan that we’re trying to get to work to some harmony towards implementing a vision that will create broad equity, restorative justice in our community, and regenerate a cleaner safer healthier environment and economy. One of the things that I’ve been exploring is the idea of ‘what if’ questions. For example, in Liege in Belgium they’re completing reimagining the food system of the city. They started with a ‘what if’ question, which was, “What if in a generation’s time, the majority of food eaten in the city were grown in the land immediately around the city?” By opening up that what if question, and inviting people in, all sorts of possibilities start to open up. Going back to 2008, if you could distil what you were trying to do there into a ‘what if’ question, what would it have been? We did a bunch of ‘what ifs’. We framed it as, “What if we could make the city fully sovereign by 2025?” was the way we actually put that question. “What if we could reorient the economy to work on all co-operative lines? What if we could create a human rights charter for restorative justice in the community?” These were the ‘what if’ questions that were interlocking, intersecting and for each one of those we came up with corresponding programmatic demands. So the Human Rights Charter, the Human Rights Commission, creating a co-operative vehicle, and then setting aside certain goals. We had about 10 ‘what if’ questions I would say that were really the centre and anchor of our project. Another one was, “How do we ensure workers’ rights?” We asked a big question of, “What if we could have a broad participatory democracy? What would it look like? What voices would it lift up? What voices would it ask to play a different role?” What we call step up, step back? And to challenge both the formal and informal exercise of power that different groups have within our overall system, the order patriarchy that men have over women. In our case the historic inequity around race that plays out in economic terms. In a general sense whites over black. These were the ‘what if’ questions that we asked. A deeper one, I think the ultimate one, that we’re still working on is, “What if we could create a truly equitable Mississippi?”, that was one of the bigger ones, right? What it concretely transformed is, could we make Mississippi – not just Jackson, but Mississippi – a beacon of radical politics? Our answer to that question has been, and is, yes. What it has really focused on is, “What if we could organise large sectors of the white working class in Mississippi”, which has been important to this, and which, outside of a brief period in certain counties, particularly in the south east portion of the state, has never really been done. But we looked at that ‘what if’ and say there’s a generation that was coming of age basically since Barack Obama was President that has a very different worldview than many of the previous generations of white people in the state that we could work with and ally with, but we have to figure out – and been working and struggling to figure out – how do we stay in consistent dialogue in relation with each other? How do we create as many opportunities of collaboration as possible? These are the ‘what if’ questions that really structured our project and it’s not like these questions ever stop. Even when you accomplish one, it just really opens up in many respects more questions that need to be tackled and solved. But that’s a good thing, and I know one of the things that you’re investigating is the imagination. Why I like it is that if you don’t ask yourself that question, then it keeps you in a static view of the world, “I’m going to play by the rules as they exist and I’m going to just try to deal with the terms and the alliances that presently are”, which is very limiting from a political space. To be able to think about, “what is it that we might actually be able to do to move a particular force?” Just to see things differently. That would speak to both, you know, its interest but also its aspirations. We think both of those things are possible. Just organising along self-interest we find to be very limiting. This is a lesson that many black organisers have found. If we look real deep in trying to build multi-racial alliances in the United States, you know, that the way the narrative is often constructed and lived, you would think that black workers and white workers have a lot in common, but there are clearly a bunch of cultural constructs and edifices that are put in place which gives us to see our interests quite differently. We say we also have to work towards people’s aspirations, not just self-interest, because in our case, historically, that can lead to some very reactionary destructive things directed towards the black community. It’s that aspiration piece that speaks to the imagination question you have. How we tap into people’s dreams and aspirations is a critical thing that we at least speak to as part of an aim and objective that we are pursuing and have to then plan our strategies, actions and how we engage, how we factor all those different things in so it’s not just one-dimensional work. One of the places I get the most inspiration is around is people and movements who’ve managed to keep really big bold ‘what if’ questions alive. Like the prison abolition movement in America. “What if there were no prisons? What if there were no police? What if the justice system worked in a completely different way?” They’re keeping a huge ‘what if’ question alive for a long period of time. Are there any tips or lessons or suggestions that people in the rest of the world can learn from those movements? About how you keep a big ‘what if’ question alive over time? That’s a good question! I’m going to think about that. The first thing is being grounded in history. I don’t think it’s an accident that the Prisons Abolition Movement has chosen that name. I know there was a debate around when Critical Resistance was first starting to use that after the conference it had in 1988, which I would credit as being the critical catalyst for that movement. It’s no accident that that came from organisers who were very steeped in the black radical organising tradition and the black radical imagination. The critical thing, what I’d point to there is if you look at our history, you have to see a long arc within in it in order to stay grounded, not just feel overwhelmed and depressed. One of the things that for me, I guess, to make it subjective, when I run into some challenging times, I remember my grandmother often saying, “If you think it’s rough, think of how rough it was during slavery.” For me that would always be recentering. Like, “Oh, okay, right, right, right.” I have far more agency, far more opportunity, far more things at my disposal than my ancestors had, that I could use to come up with some solution. So it’s regrounding, and being grounded in the abolitionist movement, the prison abolitionist movement being grounded in that history and that narrative points towards, “Hey, you’re going to have to stick with this in the long-term and not just be deluded by the kind of reforms that come here and there, that may be a step on the path towards abolition.” Right? No police, no prisons, but could also be a stop-gap measure to keep the status quo in place. It raises a question like, well, if we would accept it, like some new terms under slavery or some of the things that people historically would be offered by the south as a concession to the north to be like, we can make it easier, but if it wasn’t for the abolitionists of the eighteenth and nineteenth centuries saying, “No, there’s no way that would make being chattel easier. You’re still chattel. Altering the condition of being at your owner’s disposal doesn’t change and we have to end that relationship”. Members of Cooperation Jackson visit Barcelona to learn about Barcelona en Comu. Having a vision and staying on course with that vision is very key to a long-term organising and a long-term trajectory, and keeping the morale of the different social forces that you’re engaging up, so that people understand it’s going to take a while for us to get to where we’re going, and that there can be and there should be and there must be, reforms along the way, but we have to always stay consistently orientated towards the north star to know clearly the end goal maybe far away and may seem like a moving target, but let’s not be distracted and just prop up the existing system or change little things here and there, when ultimately we’re trying to change relationships and hierarchy and exploitation and how do we stay focused on that. Being grounded in economic history and then choosing a narrative is very important. Because you can then look at and draw both inspiration, courage and a grounding from how folks under far worse conditions chipped away at the elephant that they were fighting and they brought about some fundamental change. We still have a long way to go, but to me that would be the biggest lesson. What we would call, from a black radical position, just being grounded in the history and the perspective of that and where you’re going to. To just keep sight and keep faith really. One of the things I’ve been doing a lot of research about and talking to neuroscientists about is about how anxiety and trauma and fear and stress lead to the parts of our brain that are most vital to the imagination shrinking and contracting and our ability to think about the future in positive and hopeful ways shrinks and disappears. I wonder how you’ve seen in your community that phenomena occurring? And also, more particularly, how you’ve seen the work that you’ve done, and the new story that you’ve bought, and the new possibilities of that, how you’ve seen that shift that, or change that, or start to open up the future in a way that wasn’t there before? Another good question. The trauma is real. I don’t think anybody should doubt trauma and its impact. Because it can be, and is, at least in our community, very stifling and disabling. And the thing that we have really stressed upon, and has been of benefit to the work here in Jackson, is consistency. I can’t really stress that enough. One of the things that we always tell people is that what you’re witnessing over the past ten years in Jackson really is the accumulation of decades of groundwork that was laid, that took persistence, determination and perseverance, chipping away. Even when certain ideas weren’t popular. Even when certain oppositions were not popular. People sticking with it. Staying true. Staying committed. Being in the community in various ways. Organising political campaigns. Organising youth around arts and sports. These are all things that the organisation just remained grounded in since the early 1970s. That built up a floor of good will and a solid faith. What we found, particularly from doing the first election campaign as a measure – we didn’t expect initially in 2008-9 when we ran Chokwe for Mayor, we thought we were in a good place, but we weren’t quite sure that we would win. We thought this would be a good way to get some of the message out and broaden some of the ideas, because in large part, the initial objective I had – I was one of the people who suggested that we run one of the two key people – the initial thought that I had was to really try to gain a deeper understanding of how many people in our community were impacted by our work over the years and how many people believed in the ideas that we believed in. And then we were going to come up with a plan to really consolidate that base. We were shocked to the degree that there was already a broad base from there, and then asking how did people know about our work? Some of the things that were most interesting were people would remember the basketball programmes that we did, and the art programmes that the organisation had engaged in. That would be of equal weight to, you know, “these guys led this campaign against the Klan”. We had several Klan members who were on the police force in the 1980s. You have those things speak to equal measure in so many people’s minds. It really demonstrated to us that it was the consistency, over a long period of time that just enabled people to be like, “We trust you all. We know you’ll fight for social justice. You won’t back down under certain circumstances if there’s a problem, particularly dealing with racial economic issues, you guys are there speaking up, coming up with proposals, coming up with demands, that you were there, and that was a consistent force.” That was a major point of entry for us. In our work what we see is like, how you overcome some of that trauma, some of that disillusion and disaffection is being consistent in your practice. More so than even being consistent in what you preach per se. But being consistent in your practice I think is real critical. Because one of the deep things we hear, particularly around the politics, is within our system “it’s going to be the same thing regardless of who gets in office”. It’s like the imagination is already closed. For us, we’ve been trying to demonstrate in practice, “Hey, these are ideas that we had. These are the proposals that we put out and say we’re going to make some change” and we’ve been consistent in pursuing, building towards and been trying to advance them, and you can see it’s not just the same old, same old. From our experience I would say and to generalise it, that is very important towards both dealing with trauma but also getting people to be able to think beyond the immediate circumstance and see that some alternatives are possible, right? And that there’s some way for people to engage. But it’s a constant struggle. It’s a constant struggle. When you face a challenge, stand up to it. You may not advance, but you’re not going to lose your positioning. Without that there is no bedrock really to be able to think of something new and have confidence that not only can I think of it, but I can work towards accomplishing it, because I’ve seen it happen under these circumstances and conditions. It’s something I would definitely like to impart upon anybody who’s listening to this to understand the history and trajectory of the work here in Jackson. One of the questions I’ve asked everyone I’ve interviewed is, if it had been you who had been elected as the President of the US in November 2016 and you had run on a platform of ‘Make America Imaginative Again’ – so you felt, actually, that there needed to be a huge focus rather than on innovation and growth and all that, but actually what we needed was to really boost the collective imagination, whether in education, in public life, in politics, in commerce, so across the board, we needed a moon-shot race or programme to really re-fire the imagination –what might you do in your first 100 days in the Oval Office? The first major thing that I would have done would have been to really shut down most of the military operations of the United States. That would have been the first thing on my agenda. I would have stated it as we need to take responsibility for our overall emissions on the planet, and that we are – and this institution in particular – is the major contributor to carbon emissions on the planet. How do we address that, how do we take concrete action, demonstrate to the world our seriousness on many different levels? That would have been the first major piece. I would have supported that with a domestic programme of saying we are going to make sure that every government facility within the United States operates off of clean energy, and we’re going to do that within a five year period. That would have been the two major things that would have gotten me in a world of trouble immediately, but would have kicked off my Presidency, in this case, in this imaginary case. It really would have just opened the field up around how are you going to make those changes given the post-WWII world the United States was basically largely responsible for structuring. That would have called for a profoundly different restructuring than what Donald Trump is trying to force upon the world right now, and it would have been one that you could have easily – especially coming off the Paris Agreement, despite my many criticisms of that – but it would have been a sure fire way of saying we are serious, we mean business, and we expect the rest of the world to get on board with this, and we’re opening up some new opportunities for everybody to engage in moving towards in a carbon neutral direction. If someone would do that, or just even a portion of that, just 20% of the US military stuff is shutting down and we’re going to convert all this to solar, which itself would be a major thing, just that would profoundly change the conversation, and the economy itself on a global scale. You talked about the participatory democracy, that you have Transition Assemblies, and Citizens Assemblies? I went to Barcelona where they have neighbourhood assemblies and the neighbourhood assemblies feed in their suggestions which help to shape policy. Could you give us a sense of what that looks like in Jackson? I’ve been to Barcelona. I’m big fan. I’ve learned a lot from them. Even before then, I think a lot of the things that we try to emulate came similar things that myself and many others in within the Malcolm X Grassroots experienced and witnessed and participated in in both within the US and elsewhere. Ours always had a balance and it’s always a constant struggle here a) to keep them consistent at different points of time, but b) to make them more than expert talk shops. Typically there’s a question that’s being posed – how it’s been experienced in Jackson really – there’s a question that gets posed by a large number of people in the community, which requires a certain level of those who are doing the proposing, they’ve already done a level of organising, and a level of mobilisation to say, “We need to talk about this.” Be it potholes in the street, or some new law that’s good that’s being proposed, or something that these people want to pass or oppose, we just talk about it in a broad audience. Typically people have done their homework to mobilise in raising a question, then they say, “We want to tackle this question.” Then the first component of that typically is – and this is why balance is a constant struggle – is a proposition piece. They put an idea forward and then having people the most knowledge and experience with that subject speak up and offer their perspective, insight. Typically there’s two or three people who do that, normally, who don’t share the same views. And it’s not something that we have traditionally got to plan that way, normally it’s organic, it kind of happens that way. Then there’s the period of debate, and proposals sometimes they take place within the same meeting, sometimes it takes place sometime later after folks have been educated and informed. Then the last part is, “Hey, what are we going to do about it?” in open discussion, in debate, towards crafting some kind of action plans and policies and proposals and usually a little bit of both. What are the things that we’re going to do? What is our action plan to make this collective decision happen? Then if there’s something that needs happening, to put pressure and give direction to the city government. How that’s going to be proposed. Typically there’s a fair number of our city council people who attend any assembly, anything that’s called. Now they’re not allowed to make any formal decisions there because you know the sunshine laws and things that we have here in the United States, where they can’t be doing business without public notice, etc. That kind of piece happens and typically if something is directed towards government because its municipal government, folks will then take that to City Hall and raise it as a demand, raise it as a proposal. That’s general life of how they work here. There’s cultural differences between expressions of what I’ve seen here and Barcelona and other places I’ve engaged. But that basic proposition, education, debate and then proposal, that kind of four stage process I think is fairly universal I think to almost any assembly I’ve ever participated in or witnessed and ours is fundamentally no different in that regard here in Jackson. I spoke to Henry Giroux, do you know the activist guy, he used the term the ‘Trump Disimagination Machine’, which I really liked. That’s a good term, yeah. I just wondered what your reflections might be on that? What that feels like? In what way is the current administration does it feel like an assault on people’s imagination? “Welcome to our world, now you know what we feel like”. This is what we’ve been going through for quite some time. The lesson from Mississippi is that keeping your own orientation, your own principles, practice, and dare I say faith, is necessary to overcome just the narrowness and utter reaction of forces like Trump. They’ve always been here. In some places given more expression than in others, like in Mississippi, they’ve basically been in power since reconstruction. To not lose sight of that and to think that all is lost in this moment, and that there are ways in which we can and must resist. There are a lot of lessons that people can gain from the black liberation movement as this worked and operated here in Mississippi over that course of time. That doesn’t mean it’s not a scary time. I don’t want to give people that impression. Trump is very dangerous. I think becoming more dangerous by the day. Some of it just out of fear for the Mueller investigation and where that may lead and conclude to, but I also think as we experienced it here in Mississippi, those forces, the right forces, they have a very clear and articulated worldview, and they are willing to go to extreme lengths to fulfil their vision. We should not underestimate that at all as that’s played out in Europe during the first and second world wars. The second one in particular. We need to be on our p’s and q’s. The lesson of Mississippi is when times are rough, there’s still agency that can and must be exercised. Wallowing in a defeatist attitude is a sure way to be defeated. Stay grounded and utilise what opportunities and strength you have. That’s a key lesson that I would say should be drawn from Mississippi. We are never completely out of it unless we surrender. Free an brave and self determination, and this https://www.youtube.com/watch?time_continue=805&v=_Nt9Z2P7mPY must see , with only 29 likes? How is this possible? Transition optimaforma, it brought tears to my eyes!